The medieval art of the book. Illuminated manuscripts are medieval handcrafted books featuring elaborate illustrations and beautifully handwritten text. Originally, only manuscripts decorated with gold or silver were considered “illuminated” but, today, any illustrated handmade book from the Middle Ages can be called an illuminated manuscript. These medieval works of art included various decorations, such as small illustrations in the borders of pages, highly ornamental initial letters, and very intricate, lavish paintings called miniatures, which enriched the texts of the manuscripts. Producing an illuminated manuscript was a complicated process that usually required a number of different craftsmen and months or even years to complete. The exact composition of the entire manuscript was carefully planned out before anything was written or painted. Once this was prepared, a scribe would first write out all the text onto specially prepared parchment. Then, one or sometimes several illuminators would add illustrations using paint and gold leaf. The use of gold and vibrant colors made pages appear to be literally glowing and is the reason they were called illuminated manuscripts. 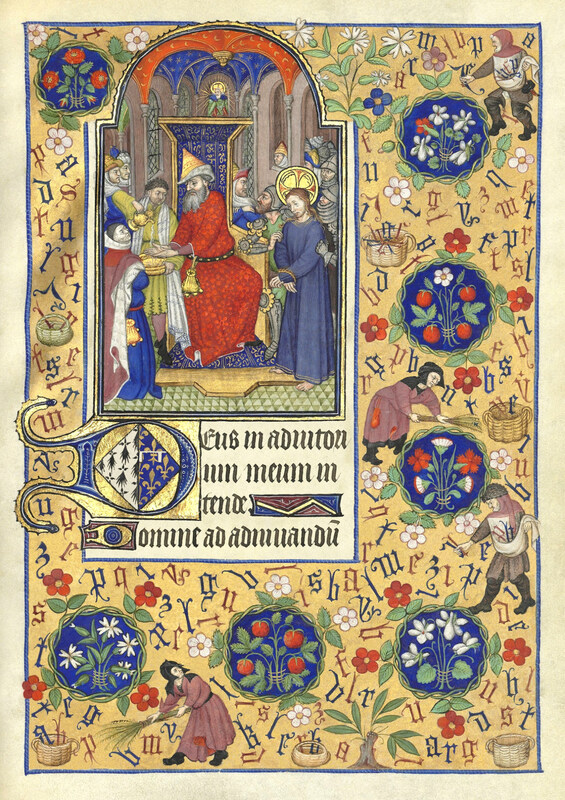 The featured image is a miniature from the Book of Hours of Marguerite d’Orléans (ca. 1426-1438).